Prior to leaving for California over Christmas, I put it out in the world that I wanted to set up a session in Joshua Tree National Park with a wonderful couple. Alisa emailed me right away and we started planning all of the details of their session. These two had recently celebrated their first anniversary and photographing them while they explored Joshua Tree together was the perfect way to capture their connection. On the morning of their session, Alisa and Robert drove over from LA. We met at the park and I knew instantly upon meeting them that we were going to have a great time. Alisa was an absolute trooper and although it looks warm in these photos, it was only about 10 degrees C in the park that day. A big thank you to my mom who was the perfect assistant and perfectly fluffed, carried, and threw the tulle skirt. Alisa supplied the green dress, the flower crown is courtesy of Design by Suzanne, and the champagne skirt was supplied by me (try stuffing that in your suitcase!). It is one of many pieces I am proud to be offering to anyone that wants to be photographed by me. After travelling to the Palm Springs area many times over the last couple years, I am so happy that I had the chance to photograph out there. 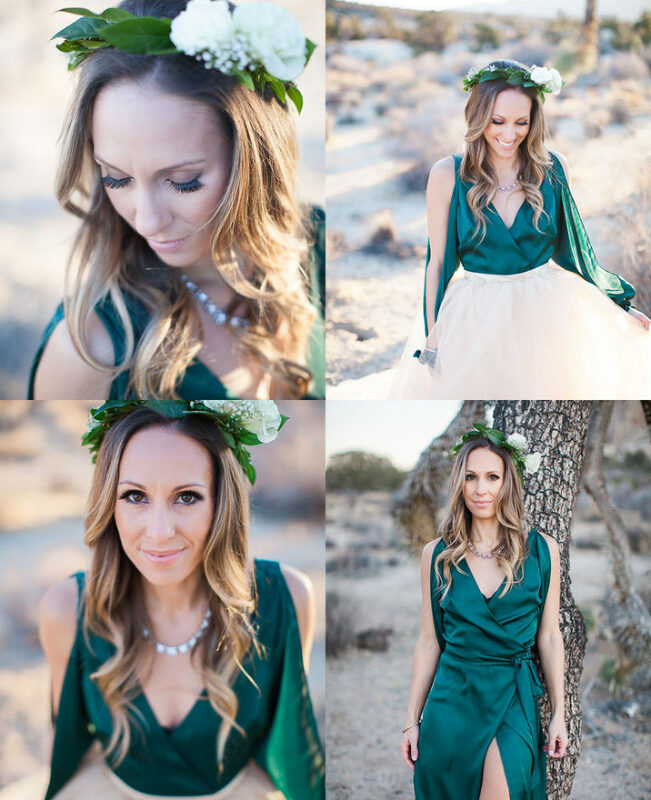 The warm colours, varying landscapes, gorgeous sunset light, and unique Joshua Trees make the perfect setting for unique portraits. Travelling and looking for the perfect way to capture your time? Photography and travel are two of my favourite things (and dogs, definitely dogs). I would love to have the chance to do both with you!